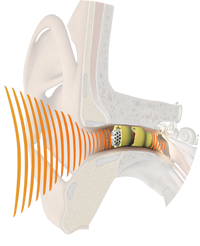 Have you heard the buzz about the newer hearing aid called the Lyric Extended Wear Device? Are you in Mason City or the surrounding area and looking for a Lyric hearing aid provider? Hearing Associates, with locations throughout northern Iowa, is a Lyric-trained provider. That means our audiologists have received extensive training on programming and inserting the device. This extended-wear hearing aid has received much acclaim because it is unlike any of its predecessors. It’s invisible. So small that it fits entirely inside your ear canal, the Lyric is the most discreet hearing aid on the market. The Lyric is comfortable and simple to use. Once placed, it remains in your ear for up to four months at a time, allowing you to hear 24-hours-a-day/7-days-a-week. There are no batteries to change and no maintenance is required. It offers amazing, natural sound quality. Because it is designed to work with your ear’s anatomy, using your outer ear to direct sound into your canal, this hearing aid delivers exceptional sound quality. Our specially trained audiologist places the hearing aid in the ear canal, without the need for surgery or anesthetic. Once properly placed and comfortable, we will program the device to meet your specific needs. After placement, we will instruct you how to adjust the settings and volume. These hearing aids can be worn for up to four months. When they need to be replaced, you simply schedule a visit at our main office in Mason City or in one of other practices throughout northern Iowa. Do you have questions about the Lyric hearing aids? Schedule an appointment today to find out if you’re a candidate for these revolutionary devices.